The base of any mobile diesel generator is the engine. Winco’s Isuzu and Iveco (Case IH, New Holland) engines are powerful, fuel efficient and durable. Both engines have extensive service networks making it quick and easy to source parts locally. 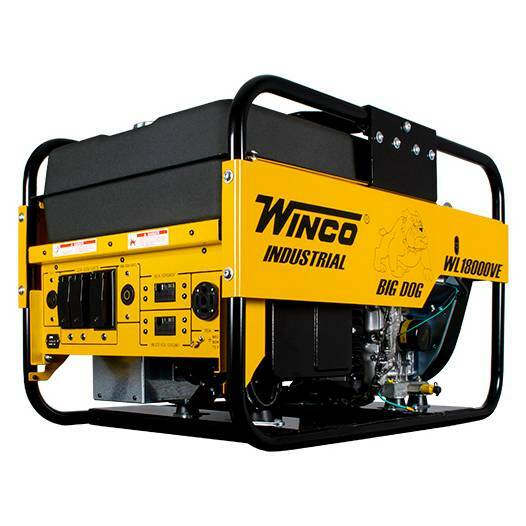 The Winco Redi-Power mobile diesel generators use high quality Stamford generator ends that are 12-lead reconnectable. The four position voltage control switch makes it quick and easy to switch between voltages. The extra switch position also gives you true line- to-line and line-to-neutral voltages so you don't have to compromise in three phase voltages. To protect your equipment Wincos uses a quality digital controller to monitor all of the important engine and electrical data. All dangerous electrical connections are protected by steel doors with generator kill switches. Two-wire start capabilities are included standard. The generators feature DOT approved trailers. An integrated fuel tank and standard electric brakes make this trailer one of the most popular models in the business. Winco offers power take off powered generators in sizes ranging from 15kW through 165kW, with either 540 or 1000 rpm gear cases. All Winco PTO generators from 25-75kW are machined, wound, assembled and tested in the United States making them the only PTO generators that are truly American. There are a couple of important factors to consider when selecting PTO generators. One essential consideration is service life. Winco literally has tens of thousands of PTO generators in the field that have proven their durability by logging millions of hours during emergencies. Winco vehicle mounted PTO generators are a time tested design that will get the job done. These generators are built in our Le Center, Minnesota facility. We control each step of the manufacturing procedures to make sure our generators will last. Various models are available in single and three phase voltages to meet any applications.